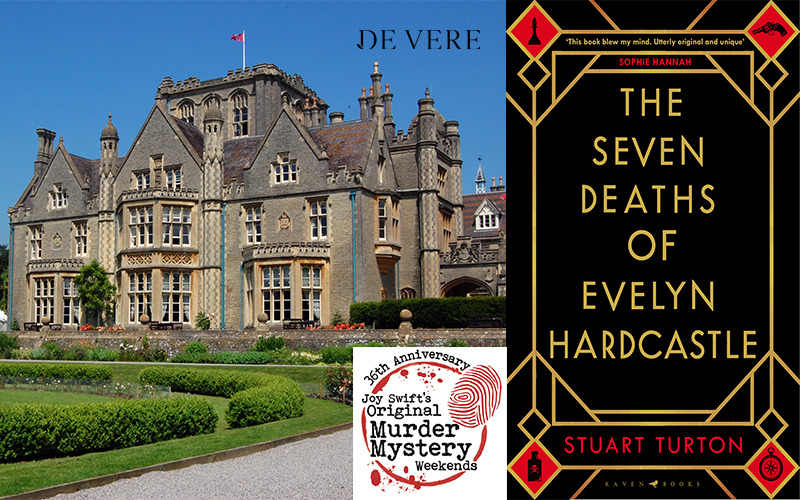 To celebrate the publication of THE SEVEN DEATHS OF EVELYN HARDCASTLE by Stuart Turton we have teamed up with Raven Books and Joy Swift’s Original Murder Mystery Weekends to offer one lucky winner a Murder Mystery Weekend for two at a 4 star De Vere Hotel. The Murder Mystery Weekend will include two nights, Dinner, Bed and Breakfast, Saturday Lunch, Cream Tea on Saturday Afternoon, and Themed Party Night and Disco at a participating De Vere Hotel and full participation in the Murder Mystery Weekend Programme, where actors remain in character all weekend and when at least three victims will be dastardly dispatched! Using the evidence in the Police Incident Room and by interrogating the suspects you can assist the police to bring the murderer or murderers to justice.